we approved two new dioceses "in formation,"
All good things! Can't wait to get home. To be a Christian without prayer is no more possible than to be alive without breathing. -- Martin Luther King, Jr. 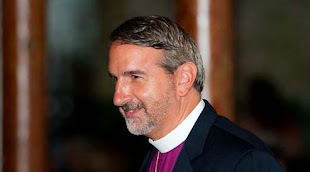 This past Tuesday and Wednesday I have been in meetings of the Provincial Council of the Anglican Church of North America in Long Beach, California. I am not a meeting kind of guy, but it has surely been exciting to see and hear of the what the Lord is doing around this embryonic season of this fresh Anglican movement in the United States. Adults are coming to the Lord. Adults, not just children, are being baptized. And new churches are being planted. The life and vitality of the Holy Spirit in this new movement is just plain exciting!! The best part of this experience... being with long-time friends in the Lord. Now for the College of Bishops meeting... and to find the beach -- this is LONG Beach. Never been to Long Beach, California before. Driven past it, but never stopped. What a surprising find!! I am here for the Provincial Council Meetings and College of Bishop meetings for the Anglican Church in North America. Will be here all week. A beautiful place to have meetings. Too bad there isn't any liesure time built into the schedule. May have to make some! Keep us in your prayers as we make decisions on behalf of the whole church. This is a wonderful group of people who love the Lord and wanted to proclaim the Gospel of Jesus the Messiah. A few weeks ago I had to fly to Virginia for a bishop's function. Having lived in Atlanta most of my life and having a wife who was a flight attendant, I usually know my way around. I usually plan on extra time to make sure I am always at the gate at least 30 minutes before the flight is supposed to leave. On this trip to the airport, I left in plenty of time allowing for traffic, etc. Well sure enough, the expressway was clogged up, and that put me behind schedule. When I arrived at the Park and Fly lot, I still had plenty of time to catch the plane. I parked and stepped onto the shuttle van and the lady gave me my parking receipt. But we just sat there! After about 7 or 8 minutes, I asked her why we were not going anywhere. She said, "Oh, you need to get on that one over there." ??? So I unloaded my luggage and when over to the other shuttle. Sat down. And then we just sat for another five minutes! When I arrived at the security checkpoint, time is starting to get tight. I looked at the line and said to myself, "Good, a short line." After I got in the line, it did not move. The minutes kept ticking away. I am starting to sweat now. The man in front of me was gracious and let me ahead of him. Once through the security area, I began to run. I even ran down the escalator to the subway leading to the terminals. I heard the "voice" at the subway train saying, "the doors are closing." I leaped in just in time to which two ladies laughed at me and said, "You just made it!" I looked at my watch and said, "we'll see." At which, they laughed again. When the subway train arrived at the correct terminal, I went into a full sprint (even up the escalator!) all the way to the gate. I arrived just before they were closing the doors. Walked in and sat down, and said "thank you Lord!" Today, I am flying out to California. I allowed even more extra time today. Everything is going well, and then the underground subway train stops in between stops. We just sit there. Minute after minute goes by! I am three minutes away from pulling the emergency door release, and the train begins to move. I arrive at the gate two minutes before the doors close. Our last night in Jerusalem coincided with the beginning of the Jerusalem City of Lights Festival and a full lunar eclipse. The Old City of the Jerusalem was divided into several different colors and a long string of light (red, or blue, or green, orange) went along the street for people to follow. The following pics are some of the street scenes. Although the pictures I am using don't show the crowds, there were literally thousands of people walking along the streets enjoying the different light presentations. Doesn't this picture make a statement? We went into the Palestinian Authority's territory today and went to see the Church of the Nativity in Bethlehem. The place where Jesus was born is surrounded by three churches: Orthodox, Ethiopian, and Roman Catholic. Bethlehem is always an interesting experience. My heart goes out to the native Arab Christians who are quickly being overwhelmed with Muslims. After a shopping spree in Bethlehem at an Arab Christian Store and lunch, we went to the holocaust memorial, Yad Vasheem. Lord, may humanity never repeat such a horrible atrocity!! Wonderful dinner tonight at Christ Church. Temps in the high 50's at night and upper 70's in the day. Shalom from Jerusalem. A Great Day for the Church!